If you manage a central reprographics department or in-plant print shop, you know that equipment downtime is something to be avoided at all cost. Your company is counting on you to turn out many jobs and countless pieces every day to support everyone from sales to marketing to customer service. The last thing you want to have to report is a delay (or worse, having to spend extra money to go out of house to complete a job) all because your digital printing press is giving you problems. That’s why digital printing press maintenance is critically important. Having your equipment inspected, tested, and proactively replacing worn parts prevents breakdowns that impact your ability to deliver jobs on time. Yet many CRD departments aren’t getting the level of preventative maintenance that’s needed to prevent parts failures and malfunctions that result in unexpected downtime. Read on to learn about the printing press service frequency experts recommend, as well as the preventative maintenance tasks that must be included in digital printing press maintenance. Digital printing press maintenance: how often? Depending on your digital printing press model, you’re probably producing between 80,000 and upwards of a million pages every month… with maximum outputs sometimes topping 2 million. That’s a lot of wear and tear on the parts that can add up to problems faster than you might expect. In fact, Canon cautions that you may experience more downtime during peak usage periods, which is exactly what you don’t want! That’s why preventative maintenance is so critical: to make sure your equipment is always able to handle the volume you need without issues. With the volume levels described above, your equipment should have a thorough inspection, cleaning, testing and tune-up EVERY WEEK by a qualified expert. Here’s what that service should include. Perform a visual inspection of copy quality. Run a service mode test print, then a network print request and compare the results for print quality differences. Inspect the entire primary and secondary fixing assemblies for worn or wearing internal parts. Replace parts as needed. Inspect and replace all worn process kit internals, including drums, cleaning blades, corona grids, starters, and developers. Inspect and replace all worn parts in the ITB assembly and adjust to system specifications. Inspect the entire registration assembly, replace worn parts as needed and adjust to system specifications. Clean and inspect each paper source pick up/feed assembly. Replace parts as needed and adjust to system specifications. Clean and adjust each installed accessory and replace parts as needed. Bring the digital printing press up to date with the latest system software release. Replenish all parts used from client shelf stock. This last step brings up an important point. Does your service provider allow you to store frequently-used parts on site to reduce wait time and get you up and running faster? And do they store other parts themselves so any repair issues can be fixed the same day? These may seem like small perks but they can mean the difference between losing a couple of hours and losing a couple of DAYS when your system needs repair. These basic steps of digital printing press maintenance are a great start, but read on for more best practices that many service providers may skip. Have you been skipping important steps when vetting production print vendors? 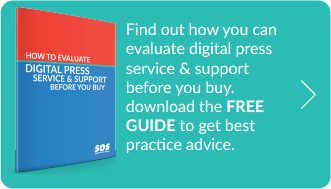 Get this guide to find out how to get the service you need: How to Evaluate Digital Press Service Before You Buy. Check for changes in the performance of your digital press. Your service tech should always ask you if you’ve experienced any new or intermittent issues with the equipment since his last visit. Perform auto gradation and calibration with shading correction (if you have a densitometer). Final post-service visual inspection with additional cleaning if necessary. Ask you to run a fairly long test job to check output. Check your shelf inventory for any parts that may need replacing soon, order parts as needed for stock. Check paper trays for misaligned or old paper, fan and reload, or toss and replace. Check optics and outer covers and clean if needed. Ask you to check your supply inventory and order if needed. Ask you if any significant increases in production are expected, and replace any parts pro-actively if warranted to meet increasing demand. Is this the level of proactive maintenance you’re getting from your current service provider? If not, it may be time to consider new options that can help you prevent digital press problems and reduce downtime. Doing so can make your operation run more smoothly, reduce the stress that comes with falling behind, and help you meet your production goals.